The function xlex() separates formulas into tokens of different types, and gives their depth within a nested formula. Its name is a bad pun on ‘Excel’ and ‘lexer’. Try the online demo or install the more experimental lexl package to run demo_lexl() locally. It is useful for detecting spreadsheet smells, which are poor practices in spreadsheet design, such as deep nests of functions, or embedding constants in formulas. Here’s an example with a simple formula MIN(3,MAX(2,A1)) (the = symbol at the beginning of the formula is implied, because Excel doesn’t write it to the file). A smelly spreadsheet is distributed with the tidyxl package. It comes from the famous Enron subpoena, made available by Felienne Hermans. How does it look at a glance? Here’s a screenshot of part of one sheet, showing the formulas rather than the cell values. It’s a financial plan, using formulas to forecast the rest of the year, and the plan for the following year. What we want to see is whether the formulas have any embedded constants; ones that are hidden from our attention, but that are driving the forecasts. While we could read each formula, one by one, it would be a lot easier to visualise the ones containing constants. We can do this with xlex() and a graph plotting library like ggplot2. The first step, after importing the spreadsheet, is to tokenize the formulas, using xlsx(). Let’s tokenize one formula to see what it looks like. # The original filename was "barry_tycholiz__848__2002 Plan Worksheet CC107322.xlsx"
The formula is (C8/7)*12-48000, and xlex() separates it into its components. There are the parentheses, the operators (division, multiplication, subtraction), a reference to another cell (C8), and a few numeric constants: 7, 12, and 48000. What could they be? The 7 is probably the 7th month, July, because of the column header “July YTD”. A year-to-date figure is being divided by 7, then multiplied by 12 to forecast the year-end figure. The 48000 is more mysterious – perhaps a future payment is expected. Embedding these constants inside a formula is bad practice. Better practice would be to put the constants into their own cells, where they could be annotated with their meaning, and perhaps even named. Then formulas could refer to them, by name, e.g. The xlex() function isn’t vectorized (because it returns a data frame), so we map it over each of the formulas to create a ‘nest’ column of individual data frames. Then we can unnest the data frames and filter for tokens that are constants, to find out which cells have constants in their formulas. Which constants are most common? Unsurprisingly, 12 and 7 are almost equally abundant, but there are also lots of 6s and 9s – two- and three-quarterly figures? Then there are some 150000s and the familiar 48000s, followed by some fractions that look like percentages, and then several one-offs. A final step is to visualize the spreadsheet, highlighting cells that hide constants in their formulas. 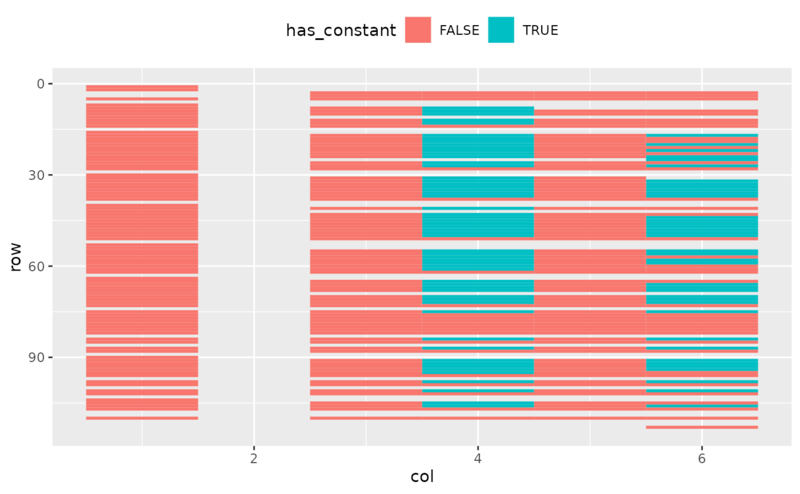 We already have a data frame of cells with constants, so we join it back to the full dataset, and pass the result into ggplot. This time there doesn’t seem to be any particular pattern, which is perhaps suspicious in itself. Using the same techniques as for detecting constants, we map xlex() over the formulas in a spreadsheet, unnest the result, and filter for tokens with particular properties. In this case, we are interested in the level of each token, which tells how deeply a token is nested in other functions and expressions. This time, we use another spreadsheet from the Enron corpus. First, an illustration. Notice that inside the first function, the level increases to 1. Inside the second function, the level increases to 2. Now let’s apply the same test to all the formulas in a sheet. The deepest level of nesting turns out to be 7, and is seen in all the cells in row 171. # The original filename was "albert_meyers__1__1-25act.xlsx"
Do you wonder what those formulas look like?